This is from just one brushing. No trick photography or fur-fluffing here either. That wad of fur really is bigger than his head. 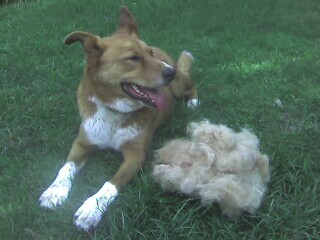 I am astonished at how much fur came out of my dog in the course of an hour. Normally he takes several days to lose his coat, but this seems to be most of it in one go. The fur wad is from yesterday; I brushed him again tonight, and while some more came out, it is negligible in comparison. I wasn’t sure what to do with the giant fur wad, so I put it in a bag with a note that said, “With love, from Vader” and hung it on the neighbors door handle. We’ll see if they think that is funny. That sure is a good amount of fur. What kind of brush do you use? I have found that the furminator is by and far the only dog grooming tool worth having. It’s kind pricey (30-40) but it’s well worth having. Furminator. Funny! I use a rake. It looks kind of like… well… a rake. I will have to take a look at the furminator, if for no other reason than comedy value. It’s just as amazing as the website makes it look. I hadn’t actually read (or heard) the whole bunny story yet. Hysterical. I can just imagine the dogs doing all this stuff. Thanks again for taking Zephie! He now only loves you. Mark Hayward Is My Hero is powered by	WordPress 5.1.1 and delivered to you in 0.482 seconds using 40 queries.